Maa Bhagwati Shakti Peeth has been established by a group of Sewadars, who are serving Maa Bhagwati with Sampurn Traditions. We are willing to help the Indian Community and the people who worship Mother, all over the world by performing Maiya’s Jagran and Chownki. 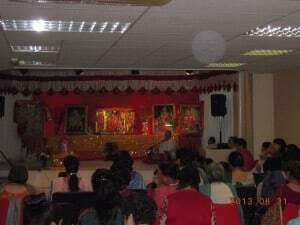 On 6th October 2005 a Bhagwati Mata Chonki was held at Long Eaton, Nottinghamshire after which the congregation consisting of people of all ages held a seminar. The congregation decided to formalize the meeting and a resolution was unanimously passed that there was an urgent need to organise such seminars on a regular basis. It was also felt that the generation that has grown up in this country and was now preparing for marriage and parenthood has many questions that needed addressing. 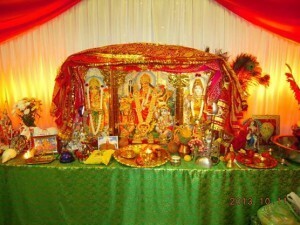 They have in Nottingham a well established and well supported Hindu Temple. 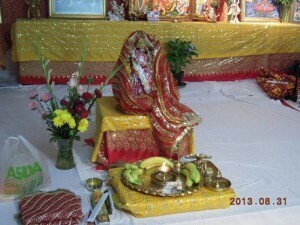 Although the Temple does have a daily programme, it was felt that there were gaps that need to be addressed. It was felt that there was need for another platform which will be inclusive of all of the community and more focused to address the questions posed by the next generation. This platform will be more open to all societies, faiths, cultures and religious beliefs. Thus Shri Bhagwati Mata Mandir Trust was formed. The discussion & congregation finally get registered as charity in 2007 as ‘Shri Bhagwati Mata Mandir & Sanatan Community Centre’. Mr Anil Randev along with other Executive committee members is working hard to raise funds for this project. The people from all walks of life and from different faiths have been very generous in financial and material support which the Executive Committee is very grateful and would like to express its thanks. 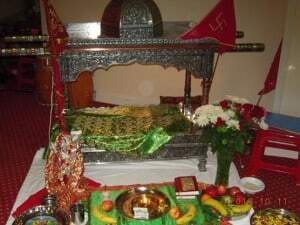 Bhagwati Shakti Peeth is situated in East Midland and well connected with different part of UK, being central place. East midland airport is just 20 – 30 mins away from temple. Nottingham Train Station is 10 mins and Nottingham bus services is one of the best in UK.